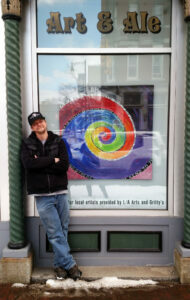 AUBURN — Kris Lachapelle, local champion supporter of the arts, is the next Featured Artist in the Gritty’s Art and Ale window. Lachapelle is a Lewiston native who thrives on creating. Though he is challenged daily by anxiety and mild depression, he uses many forms of art and creation to help him cope — songwriting, playing guitar, writing short stories, drawing and painting are some of his outlets. Music is his greatest passion and he feels most comfortable writing songs to tell his story. Lachapelle also enjoys being outside his comfort zone and allowing for vulnerability in hope of inspiring others to do the same. Watching the dreams of other creative spirits become reality not only fuels his fire, but sharing it all helps build the community he loves. His work will be on display for the month of March.